I've got tons of smiley faces from Halloween, but my favorite is this one I took while Little Miss was parading down the hallway of her school. 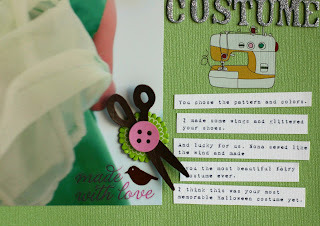 I made this layout for the Weekly American Crafts challenge. (Dont forget you can always click on a photo to see it larger). Supplies Used: buttefly patterned papers (American Crafts), 2 different kinds of Thickers (American Crafts), vinyl shapes (American Crafts), chipboard shapes (American Crafts), Flair button (American Crafts), rub on (American Crafts), made with love clear sticker (American Crafts) and cardstock: Bazzill Bling, Bazzill basics. 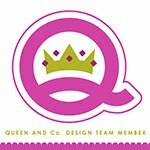 In other exciting news....Tiffany is looking for some new designers for the ScrapTiffany challenge blog. The Design Team Call is posted HERE. Go check it out! You have until November 25th to get your application submitted. Tiffany is wonderful to work with, the challenges are a blast and really keep your scrapping mojo going. Plus she will truly consider applicants who've never been on a design team before (this was my first!!). So what are you waiting for? Get to work! I love that photo!! Great job showcasing it! Love that photo!!! Great lo! The little scissors are so cute. 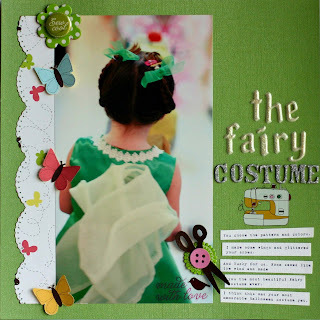 What a cute embellishing on this page! The scissors and sewing machine rock! Love the layout!!!!!!!!! :) Have a great Sunday!!! Such a cute layout! Love the little sewing embellishments. That is so adorable, love both the layout and the costume! I love, love, love this LO! that is a wonderful photo and i love what you did with it.